The first flow-related phenomenon we'll discuss is the flow void. This only occurs in spin-echo (and fast spin echo) sequences, typically with T2 weighting. 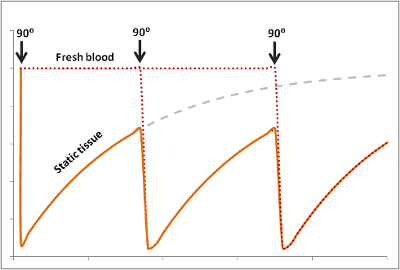 Fast moving blood experiences the 90-degree pulse but misses the 180-degree rephasing pulse, so its signal decays before the echo is read out. Blood moving through the slice experiences the 90 degree pulse but most of it exits before the 180-degree pulse. Only blood that is present for both pulses contributes to signal. Gray represents unexited or dephased tissue. Some references refer to this flow void phenomenon - related to the 90 + 180 pulses - as a time of flight effect (not to be confused with TOF angiography). Flow voids from TOF effects only occur with spin echo (and fast spin echo) sequences, since gradient echo sequences do not have 180 degree RF pulses. You can get signal loss from flowing blood in gradient echo sequences because of flow-related dephasing - see below. Flow voids are more pronounced on T2-weighted sequences because those have longer TEs (i.e. longer times for the blood to move between the two pulses). We can take advantage of the same concept to generate the black-blood images in cardiac MRI. These exaggerate the flow void effect by employing an inversion pulse to null signal from moving blood, but a full discussion is beyond our scope here. In many ways, this is the opposite of the flow void phenomenon. Flow-related enhancement is typically seen in gradient echo sequences (which do not have the 180-degree rephasing pulse and typically use very short TEs, making any flow void effect negligible). When an MR scanner images a slice of tissue, it subjects the tissue to multiple 90-degree pulses to flip the magnetization into the transverse plane and also cause T1 weighting. Remember that after the first 90 degree pulse, the tissue is only allowed to recover a certain fraction of its longitudinal magnetization - determined by TR - in order to give T1 weighting to the image. The longer the TR, the more recovery occurs, and the less T1 weighting. Of course, this only happens if the tissue stays put and is subjected to these multiple pulses. If fresh blood flows into the slice, it will start out with all of its longitudinal magnetization. Therefore, after a 90-degree pulse, it will have a lot more transverse magnetization than the surrounding tissues. This will make it bright on the images (seeming like it has a short T1). The animation shows the effect of successive 90 degree RF pulses on static and flowing tissue. Fresh blood (red) that flows into the slice will not have experienced prior RF pulses, so its longitudinal magnetization is at maximum. Any moving blood still in the slice (orange) acts just like static tissue (yellow). The plot on the right shows the same phenomenon numerically. Remember that the signal in the transverse plane depends on the 'stored' longitudinal magnetization that has recovered since the prior pulse. The degree to which this effect occurs depends on the velocity of the blood and the TR of the sequence. It also depends on the direction of scanning - if the scanner has already saturated the blood entering the slice because it came from the slice just before, then this effect will be less or nonexistant. Note that flow-related enhancement occurs at much lower velocities than required for the time-of-flight flow voids - this is because it depends on TR instead of TE (and TR >> TE for most sequences). This effect is particularly strong in gradient echo sequences, which do not have time-of-flight effects and tend to have short TRs. The short TEs of gradient echo sequences minimize flow-related dephasing, as well. Flow-related enhancement depends on the slice orientation and the direction of scanning (i.e. cranial-caudal or vice versa) compared to the direction of the blood flow itself. If the protons in an adjacent slice have been saturated before flowing into the current slice, flow-related enhancement will be diminished or nonexistant; if blood is flowing within a slice, there will be no enhancement. This same concept can be harnessed for time-of-flight MRA. If you entirely saturate the protons in a slice, then the only protons with signal will be blood flowing into the slice. Let's first review how radiofrequency (magnetic field) gradients cause phase shifts in precessing protons. (For more details about how gradients are used for phase encoding, see the section on Spatial Localization.) Remember that when a magnetic field gradient is on, the protons precess with a slightly different frequency since they experience a magnetic field slightly greater or lesser than B0 (the amount depends on their position and gradient strength). After the gradient is turned off, they revert to the same frequency as all the other protons, precessing in the uniform magnetic field of the magnet. But, they 'remember' their experience in the gradient by keeping a phase shift. In other words, they rotate 'off cycle' from the other protons. The picture below illustrates this point. Example of a Phase Shift. The dashed blue line is the original precession plot. A gradient is applied (gray line), and the precession speeds up briefly (solid blue line). Note that even after the gradient is off, the two plots are out of sync. As you can see, the angle remembers each of its phase shifts. Of course, angles can only measure up to 360 degrees - after that, it wraps around from 0 again. 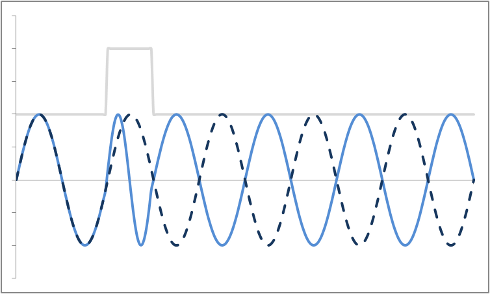 Effects of a Phase Shift on Precession Angles. The gray line shows a magnetic field gradient turned on for a brief time. 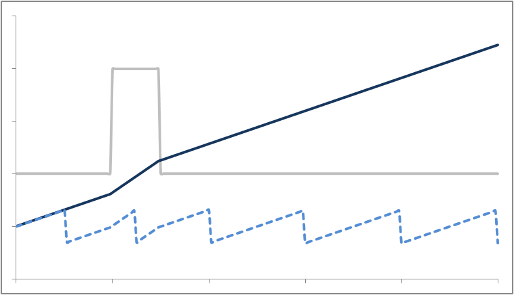 The solid blue line represents the angle of the proton, which is constantly increasing - and it increases more rapidly when the gradient is on. The dashed blue line is also the angle - but it wraps back to 0 at 360 degrees. Protons that are moving (e.g. in blood) experience different magnetic field strengths, as gradients vary in space. While they will precess at the same frequency as the stationary protons around them when they're in the slice, they will still 'remember' the phase shifts from those earlier different frequencies. This phenomenon is called flow-related dephasing. Illustration of flow-related dephasing. Moving (blue) and stationary (orange) protons in the presence of a constant gradient Gx (red). Dashed lines show the phase φ of the two protons over time, while solid lines show position. We can take advantage of this phenomenon to measure velocity of moving blood - this is called Phase-Contrast MR Angiography. This dephasing will show us areas of turbulent blood flow, such as stenosis or regurgitant gets from dysfunctional heart valves. Moving (blue) and stationary (orange) protons in the presence of a biphasic gradient Gx (red). Dashed lines show the phase φ of the two protons over time, while solid lines show position. The stationary protons end up with no net phase shift at the end, but the moving protons do have a phase shift. Why is that? Well, as you can see, the gradient is stronger as the proton moves farther out - therefore, while the amount of time is balanced, the second half of the gradient pulse actually causes a greater phase shift. This biphasic gradient is exactly what we want for Phase-Contrast MR Angiography; if we measure the phase shift, we know how far - and therefore how fast - the proton was moving. In order to fully compensate for moving protons, we need to add another phase (or "lobe") to the gradient pulse. Remember that the gradient is stronger as the proton moves out, so we need an extra 'kick' at the end. The gradient also has to balance out overall so that stationary protons do not end up with a phase shift. We can use a triphasic gradient, as you see below; the ratio of the lobes is 1:-2:1 (which adds up to 0). Moving (blue) and stationary (orange) protons in the presence of a triiphasic gradient Gx (red). Dashed lines show the phase φ of the two protons over time, while solid lines show position. In this example, the phase shift of both moving and stationary protons is zero at the end. Thus, moving protons will end up with the same amount of signal as stationary protons. This is what is done to create a control image for phase-contrast MRA (for background subtraction). It's also what happens in bright-blood cardiac MRI sequences, so that you can see the blood without all sorts of dephasing artifacts as it moves through the heart. Now, one thing we haven't focused on is the dynamics of the proton motion. It turns out that the triphasic gradient only works if the proton moves at a constant speed. If it's accelerating or decelerating - things that often happen in stenotic jets, for example - then you will get dephasing. You can add extra lobes to the flow-compensation gradient (e.g. 5 lobes instead of 3), but the more lobes you add the longer it takes to make the gradient. Flow-related dephasing is greater in sequences with longer TEs (this exaggerates the dephasing, as there is a longer delay before the echo is measured). The simplest flow-compensation gradient has 3 lobes, but this will only work for protons moving at a constant speed. The more lobes you add, the longer it takes - so your minimum TE increases. That leads to lower signal because of T2 (or T2*) decay. Turbulent flow, as happens with stenotic jets for example, is so 'random' that flow compensation cannot ever fully compensate. Most of the artifacts discussed above relate to essentially constant blood flow. However, as we all know, arterial blood does not move constantly; rather, velocity dramatically increases in systole and decreases during diastole. This phenomenon is responsible for the patient's pulse, obviously, and produces artifacts in the MR image as well. Recall that in MR imaging, the phase encoding process takes place over a relatively long period of time (up to several seconds). This timeframe is long enough for physiologic processes to occur within the imaging slice, including cardiac and respiratory motion. Since some lines of k-space are acquired while the body is in one state (e.g. systole) and others while the body is in another state (e.g. diastole), this introduces an artifact in the MR image. 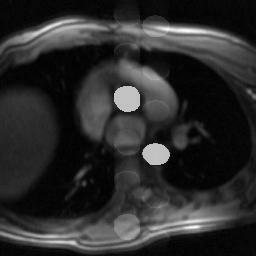 The artifacts produced by bulk respiratory or cardiac motion are directly discussed in the page on MRI artifacts. Simulation of pulsation artifact (vascular ghosting), with phase encoding in the AP direction. Vascular ghosts can occasionally simulate pathology (famously, the aorta can simulate a segment 4 liver lesion). If the ghosts obscure important anatomy, one can switch the phase encoding direction, which will change the direction of the artifact. Using flow compensation gradients or black blood imaging will reduce this artifact, as well. Copyright 2013 Mark Hammer. All rights reserved.